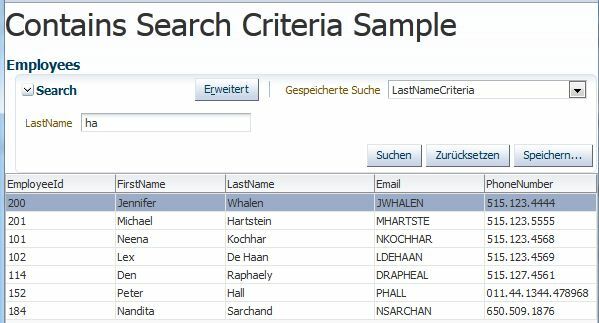 Some time ago a customer asked how to use more sophisticated search operands in a ViewCriteria like Oracles CONTAINS or CATSEARCH functions. CONTAINS and CATSEARCH are part of the Oracle DB 10g and 11g (Enterprise) and offer full text search capabilities (Oracle Text) for columns (even columns containing pdf or word documents in a blob) and external data. As the customer extensively uses full text search the question was how to integrate this functionality in existing and new to develop ADF rich faces applications. As most of the queries are done using view criteria I looked for a way to integrate the CONTAINS search as operand in the ViewCriteria wizard. A thread on OTN I opened for this issue gave some inside hints on how to try to implement this. Steve Muenchs hint to add the operator directly in the XML definition of the ViewObject (VO) did not work out. The solution I show in this article is a variation of Jobineshs blog. 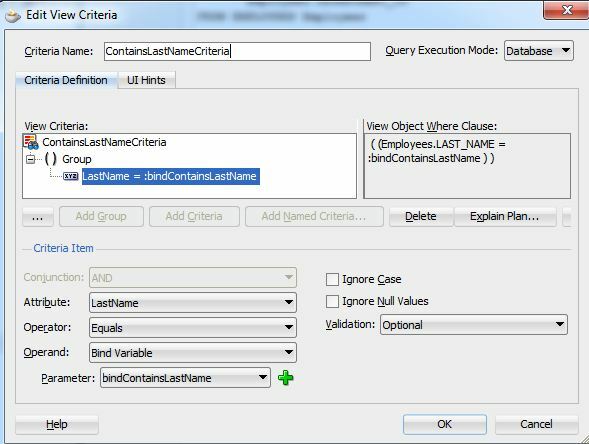 I overwrite the getCriteriaItemClause(…) method to generate the desired SQL clause and add it to the rest of the query. One problem needed to be solved: how to trigger the use of the CONTAINS in the query. As I mentioned before, putting the CONTAINS as operand into the definition of the VO is to cumbersome as it has to be done in every VO where you want to use the CONTAINS search. In the end I used the bind variable to trigger the special treatment. Each bind variable provides custom properties which I use as trigger. I use the DESCRIPTION property (you can use your own name) and add CONTAINS as value. The overwritten getCriteriaItemClause(…) method checks for each ViewCriteriaItem if its uses a bind variable with the DESCRIPTION set to CONTAINS. If this is the case I generate the SQL clause for the CONTAINS search. OK, lets walk through the implementation. First I need to create the CONTAINS index which I want to use in the ViewCriteria. I like the index to be case insensitive, so I need to define a preference which is used to alter the index in this way. As a CONTAINS index doesn’t automatically synchronize I change this behavior too, so that I don’t need to do this by hand. For more info about this kind of index check the Oracle Text Reference. As you see I choose ‘Equals’ as operator. It does not really matter what I choose, as the query where clause I build will overwrite it anyway. Instead of the default name “DESCRIPTON” you can choose any other name you like, just overwrite the name field in the dialog. That’s about it for the code, lets look at the running sample which you can download from here BlogContainsSearchCriteria.zip. Remove the ‘.doc’ suffix after downloading the sample work space for JDeveloper 11.1.2 as it contains a normal Zip archive. After the start of the sample app you see a normal QueryPanel with table component which I dragged fro mthe DataContron onto a page fragment. Select ‘ContainsLastNameCriteria’ from the search select list and enter e.g. ‘ha%’ into the LastName input field. The big difference is the usage of ‘UPPER’ and the ‘%’ in front and after the bind variable. The usage of ‘UPPER’ is the result of selecting ‘Ignore case’ in the view criteria editor. One disadvantage of using UPPER is, that if you have defined an index on the column (LAST_NAME in this sample), it can only be used if it was created with the UPPER function too. For small data volumes it’s OK to use a query like this without an index, but if you query big volume data it’s an absolute (time) killer. Next the usage of ‘%’ before the bind variable is problematic too fro big volume data, as the DB needs to read each value to match it against the expression. The result also differs from the desired as names like ‘Kochhar’ are found too. The very popular web side Ask Tom has plenty of threads discussing this. The sample workspace contains this criteria and a mixed criteria to show that you can mix normal criteria and the special criteria in one criteria group. Feel free to play with these cafeterias too. The technique shown here can be used for almost any other SQL where clause which is not part of the ViewCritera editor (e.g. you want to call a pl/sql function as part of the ViewCriteria). This entry was posted in ADF, ADF Faces, ADF Faces RC, JDEV11.1.2.0.0 and tagged 11.1.2.0.0, ADF, ADF Faces RC, af:query, sample, SQL, ViewCriteria, ViewCriteriaItem, ViewObject by Timo Hahn. Bookmark the permalink. Thanks! This is much helpful.